Chaton, glass rhinestone, black diamond, foil back, 1.8-1.9mm faceted round, PP12. Sold per pkg of 72. Item Number: H20-4243BS Have a question about this item? Glass rhinestones offer excellent light reflection with their pointed back, and give designs additional flash with their foil backing. Foil color varies. Machine-cut for consistent size and shape. Ideal for use with polymer clay and Apoxie® Sculpt. Size PP12, approximately 1.8-1.9mm. Chaton, glass rhinestone, black diamond, foil back, 1.5-1.6mm faceted round, PP9. Sold per pkg of 72. Chaton, glass rhinestone, black diamond, foil back, 1.3-1.35mm faceted round, PP6. Sold per pkg of 72. Chaton, glass rhinestone, black diamond, foil back, 1.9-2.0mm faceted round, PP13. Sold per pkg of 72. 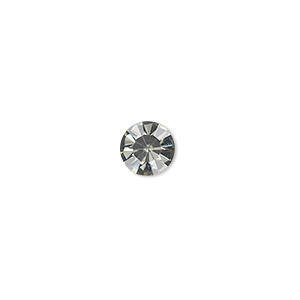 Chaton, glass rhinestone, black diamond, foil back, 1.6-1.7mm faceted round, PP10. Sold per pkg of 72. Chaton, glass rhinestone, black diamond, foil back, 1.4-1.5mm faceted round, PP8. Sold per pkg of 72. 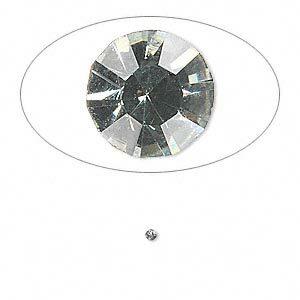 Chaton, glass rhinestone, black diamond, foil back, 1.7-1.8mm faceted round, PP11. Sold per pkg of 72. Chaton, glass rhinestone, black diamond, foil back, 7.93-8.16mm faceted round, SS38. Sold per pkg of 12. Chaton, glass rhinestone, black diamond, foil back, 3-3.2mm faceted round, PP24. Sold per pkg of 60. Chaton, glass rhinestone, black diamond, foil back, 6.14-6.32mm faceted round, SS29. Sold per pkg of 18. Chaton, glass rhinestone, black diamond, foil back, 2.4-2.5mm faceted round, PP18. Sold per pkg of 72.